Image courtesy of L. Muir, Stirling. 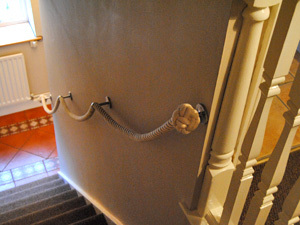 Hello James - yes the stair rope is now in place, and looks terrific. We have been most impressed with the whole experience, right from first coming accross your website, to installation. It was so refreshing and reassuring to receive your emails keeping us up to date with how our order was progressing, and finally getting the finished product exactly when you said we would. Excellent service all round!! Just to let you know our stair rope arrived safely last night and it's absolutely PERFECT!!! We're completely thrilled and it couldn't be better. Thanks so much for your expert guidance with measurements, for being a pleasure to deal with and for doing such a marvellous job! it's arrived and we like it so much, it's a wonderful product of very high quality, and I love your art in knots. Thank you for all your help Mister StairRope, it was a pleasure to find you. It's beautiful - thank you. Can I just say thanks very much for your excellent customer service. Being fitted this weekend. Will look fantastic - a great high quality product that is going to really suit the stairway and is contemporary in a good old fashioned way. All the best for continuing business success. The package arrived yesterday - thank you so much! Looks just perfect to our house. Many thanks for the stair ropes which are now installed and look superb. Colour of ropes and the finish on the brackets were exactly the right choice. A great service much appreciated. Just to say the rope was just perfect, we are really pleased with it. D. F. Mills, Yorktown, VA, U.S.A.
Is installed as of today and is a thing of beauty! I just wanted to tell you how pleased I am with the stair ropes which I have received from you. My father put both ropes up today, and both staircases look fantastic. The colour and quality of the rope and brackets are first class, just how I hoped they would be and more. I have a disabled child, and to see how easily he now manages the staircase is great to see. The walls no longer look bare, and the ropes make a very cosy cottage feel to my home. 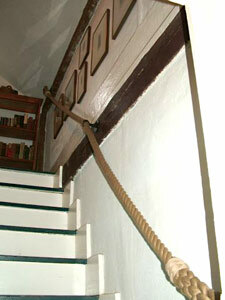 Stair rope much admired at the property. Photo attached. Thanks again for all your help in this. We're very happy with the result. The quality of the ropes, the knots and the brass fittings is first class and the overall effect on our stone staircase is just what we had hoped for. On top of that, the ropes work very well as handrails. Thanks again for all your help with the measuring and ordering. Hi James, I received the ropes, awesome thank you love them!!! 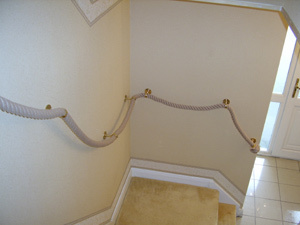 My stair ropes have been fitted today and they look very smart and I am delighted with them. Many thanks for all your help and getting them here in such good time. Really pleased and if you ever need a testimonial/reference, just let me know. 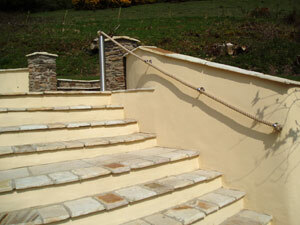 The rope looks great - I am very happy and I have attached some photos for you. When I get some more stairs, I'll certainly give you a call! Stair ropes arrived this morning and are already up and look fabulous! Really sorry for the late reply. 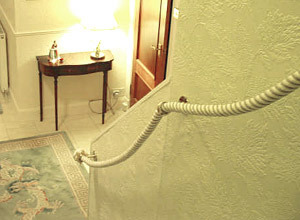 We have received the stair rope and we are very happy with it, and will be recommending you to all our friends and family. Thanks again. Just to let you know that the rope arrived in this morning's post. Thank you for doing it so promptly. It is beautifully made and I am very pleased with it. B. Knauss, Birmingham, Mi, U.S.A. I received the package on Tuesday. Love it! Can't wait for it to be installed. The StairRope you sent was exactly what we ordered and expected. I couldn't wait to see it installed so I finished that up last night. It fits perfectly and looks great! I am very impressed with the personal touch that you provided by keeping us informed regularly and accurately about the status of our order. That kind of service, especially overseas and via the internet is very rare in these days and times. I wish the very best for your company and hope you maintain that quality as a high priority. Thanks again for the special care and quality service. It was certainly a pleasant experience doing business with you and your company. And most of all we love our new StairRope! 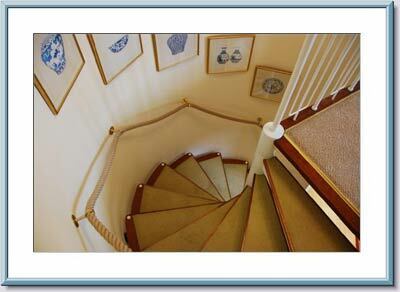 Many thanks for a fantastic product which has now transformed the look of our staircase. Really pleased with every aspect from user friendly website to delivery. Many thanks for a first class service. Just to say the rope has arrived and looks terrific. I'm about to start the fixing now...fingers crossed. Thank you so much for all your help and for making it so quickly over a bank holiday weekend. Very much appreciated. The rope is duly installed - with only minor hiccoughs (the drill battery expiring midway through) and I'm attaching the photos of the rope in situ, as promised. We are absolutely delighted with it - our aim at the outset was to install something functional (to help my arthritic mother up the stairs) and unobtrusive, but the end result is not only very stylish but it really fits in with the character of the house. Warmest thanks again for your swift and expert help. You'd be very welcome to use any of the photos or indeed to quote any of my comments. Reading other people's comments on your (excellent) website certainly instilled confidence in me that you would provide the top-class service you did. Meanwhile my mother is benefitting from the rope's support. Thanks again for getting it to me in time for her visit. T. Bentley, Longleat House, Wilts. Many thanks for doing the ropes last week. I'm very pleased with them and I've just been in the maze with a group of designers from Disney and they liked them too! 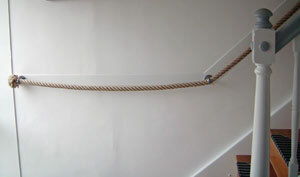 The rope and parts look superb and this will make a splendid and much-needed addition to our house. Thank you for your advice, guidance and expeditious handling. We have received the railing. It is terrific and very well made. We especially appreciate how tight the knot and the rope are. It's so beautiful, James. It arrived half an hour ago, is already in position and we have been trying it out. It is totally beautiful, and we are delighted with it. I'm not surprised you are busy, your website is excellent and knocks spots off your competitors! Just to let you know I received the order today and I am very pleased with the brackets and the rope. Thank you for the work and skill put into the making of the brackets. 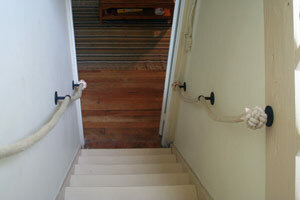 Once installed they shall solve the problem of a very narrow staircase and still look good. I think as well as making our stairs safer it will also add an element character and fun to our house. I put up the stair rope today and it looks brilliant. I've attached some photos for you. The hardest part was drilling the holes and getting the screws into the 175-year-old chestnut beams (they are as hard as rock and broke one of my drill bits). Thank you so much. Thanks so much for the stair rope, it's absolutely spot on! So it was worth all those lengthy emails and phone calls. Will recommend you to friends! All safely installed yesterday afternoon and I am very pleased with the result - it gives exactly the look that I was after. Many thanks for interpreting my ideas and turning those into a workable solution. Thank you also for your prompt attention and for keeping me advised of the process and timings. The ropes arrived yesterday and are superb! They'll be perfect in the winding stone stair case...I really love the leathery hempy smell too. The ornate plates were definitely the right ones to go for - we're delighted, thank you ! Many thanks for the quick turn around. It has been received in good order. I will most certainly recommend your services as they have been outstanding. A quick note -the stair ope has been installed and it looks great - you did a fantastic job - I hope that others who visit my house might inquire about it so I can pass along your name and contact information. We are exceptionally pleased with our new stair rope! It is in perfect keeping with the character and age of the house, and could have been there for generations. Contents look top notch. Thank you very much for such a prompt service. All arrived y'day pm...thx a lot - all I have to do now is put it up! many thanks..It promises to look lovely...we love that big chunky rope! Received thank you. Looks lovely - can't wait to see it up. Thank you for everything you have done. Greetings from wet West Wales. The rope arrived safely today. It is exactly what I hoped for. Just to let you know we've received the rope and all is in place - it is brilliant!! Thank you so much for such a prompt service. It is very much appreciated. We received our rope today - that was fast! It looks fantastic and we are thrilled to put it up tomorrow. Thank you again and we appreciate your great work! 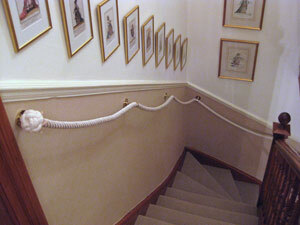 I just wanted to drop you a quick email to say a big thank you for my lovely stair rope. We have spent some time this weekend putting it up and it truly looks perfect. We couldn't be happier with it! Received yesterday with thanks - very rapid service and high quality. Just wanted you to know, this order arrived safely! It looks great, exactly what we wanted, now just waiting for someone to put it up. Just wanted to let you know that not only did I think your rope hand rail/brackets look great, the client made a special point of telling me that she was especially thrilled with it.....her words "Wherever you got this, it was well worth the wait." Many thanks for your e-mail on 9th Feb., and I can now confirm the safe arrival this afternoon of the rope and fixing etc. which look very smart indeed ! It is now up to me to fit it with equal professionalism ! I just wanted to let you know that the stair rope arrived today. Thank you very much for the quick and effortless way the order was handled. 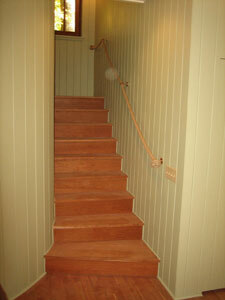 I am very pleased with the result, the stairs look amazing. My dad installed the stair ropes today and they look brilliant. I really do appreciate you going the extra mile to get them to me and will recommend you to my friends. Stair ropes delivered on time and fitted yesterday and look stunning in situ. The handyman fitted the stair rope last night and it looks amazing, all the measurements and drops are as they should be, I would definitely recommend the string and Blu-Tack method. Just wanted to say that our stair rope came last Monday, as planned. Put it up on Saturday and it looks amazing. Thank you for your professionalism; so rare these days! ...already been fitted and looks fabulous! Your products are such great quality. Better late than never I thought you might want to see a snap or two of the stair rope you made for me last autumn, for a medieval watchtower in Italy that we've restored. We're very pleased with it indeed. Image: J. T. Connolly Associates, Inc. 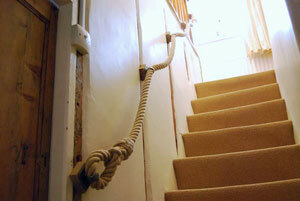 I bought a stair rope from you a while back for my Victorian cottage in Worcestersire. It has now gone up and this is just to say how absolutely fabulous it looks and how thrilled I am with it. Everyone who comes into the house sees it and without exception everyone has commented on it and admired it. I was also seriously impressed with how easy it was to order from you and how quickly it arrived. J. T. Connolly Associates, Inc., Montrose, NY, U.S.A. Thanks for the rope - received it yesterday. It was a pleasure dealing with your company. 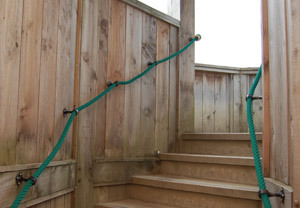 The stairrope website looks good and is very informative and your quick responses to my email questions helped to make this a very smooth transaction. Just to let you know, we had the stair ropes put up in the house in Portugal, both flights of stairs, and it truly transforms the place. I couldn't have even hoped that they would look that good. Many thanks for all your attention during the course of our purchase, delivery etc. 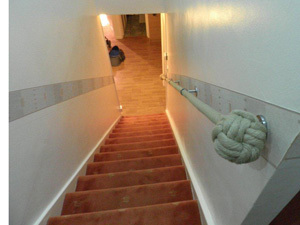 I fitted the stair rope today and it's exactly what we wanted. 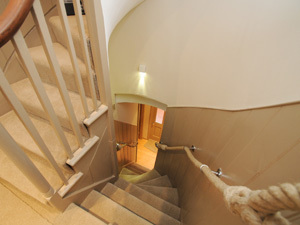 ...It's made a real difference to the stairs and I would like to thank you for your patience, skill and advice. Dear James, The ropes are up and they are sensational. Many thanks for doing them for us so nicely and so quickly. The clients are very happy. Just wanted to say a big thank you for getting the stair rope and fittings to us in time; it looks amazing and is helping me considerably following my knee op last week. Great service and a lovely product. 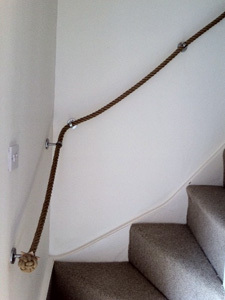 The stair rope arrived this morning and we are absolutely delighted with it. Thank you so much for the prompt and efficient service and the excellence and suitability of the rope. Not the best photographer, I'm afraid but I've tried to show the beautiful detail of the rope. Many thanks - we are delighted with the result. All received and they look amazing. Thanks so much for such quick and good service. Dear James, The rope arrived and is in situ. Looks great and have recommended to many more. . I just love my stair rope, gives me great pleasure everytime I go up/down the stairs, and has been much admired by visitors already. Fitting went well, even for a DIY disaster zone like myself. Looks great, and friends are asking about it already. Hope some of them may be in touch soon. 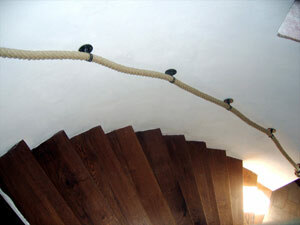 We received our stair rope yesterday and have fitted it - absolutely lovely. Thank you for a quick, reliable and informative service. Thanks very much for the stair rope, it arrived the day after your e mail. As you can see from the attached photos it's up and looks fantastic. Thanks again for all your help and advice james.